Port Blair, Sept. 29: In a swift and well coordinated Joint Anti Poaching Operation, 07 Myanmarese nationals were successfully apprehended off Barren Island on 27 Sept 13. Indian Coast Guard Dornier Aircraft on patrol had reported sighting of one suspicious boat near Barren Island at 1010 hrs on 26 Sep 13. On sighting by the Coast Guard Dornier, the boat closed land and four to five personnel escaped ashore. Immediately the information was passed to all maritime security agencies and a joint anti poaching ops was launched by Joint Operations Centre (Coastal Security), Andaman and Nicobar Command. Indian Naval Ship Bangaram, on surveillance sortie to NGI, was diverted to sanitize the area and Coast Guard Ship C-146 sailed from Port Blair for investigation. An additional Naval Dornier was also launched for sea-air coordinated search. The Coast Guard Ship C-146 apprehended one unmanned wooden boat off Barren Island which subsequently sank given poor condition of the Boat. A Joint Anti Poaching team comprising Army & Marine Police personnel embarked onboard Indian Naval Ship Battimalv was sailed to augment resources. 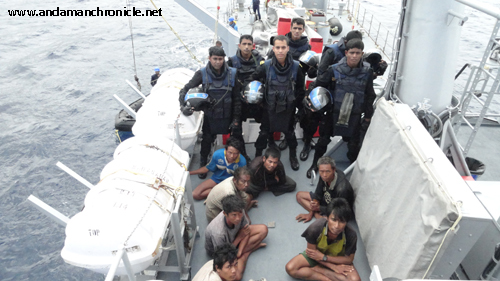 In a well coordinated operation seven poachers were apprehended by Indian Naval Ship Bangaram. The Army and Marine Police personnel sanitised the Island and confirmed no further presence of poachers after which the operations was called off. The apprehended Poachers have been brought to Port Blair for further investigation and trial. The incident is yet another apprehension by ANC as a result of enhanced Coastal Security measures. This brings the tally to 71 poachers and 09 boats apprehended in 2013. All fishermen and mariners have been requested to inform any suspicious activity at sea or near the sea shore immediately to local police station or to the Coastal Security Helpline No 1093.